The second day of the fashion event saw beautiful bridal wear, vibrant travel-friendly wear and fun contemporary ensembles. Much like the first day, the second day of the Bombay Times Fashion Week (BTFW) was grand and celebration of fashion and more.The second day saw shows by Anshu Jain, ExtraordiNaari, Swati Mishra, Kiaan by Sonal Garodia ,Kidswear brand Hopscotch, RAR Studio, Narendra Kumar and Princess Diya Kumari . The first show was a collection by ATDC. The Bollywood inspired collection consisted of smart casuals for everyday. United Continents 2015 runner up, Sushrii Shreya Mehta walked as the show stopped in stunning red number and Bollywood villain, Ranjeet. Next up was special one! ExtraordiNAARI was a women’s wear ethnic collection presented by Viviana Mall. The entire collection was showcased by beautiful, strong women on wheelchairs, thus giving the collection its. Swati Mishra’s collection of reds and blacks were all about form fitting gowns, skirts and flowing sleeves. Bollywood actor, Soundrya Sharma close the show for the designer. Kiaan by Sonal Garodia was a collection of the most beautiful white bridal gowns. Ancestry’s Indo-Western collection was all about easy-breezy silk and cotton leisure-wear. Dia Mirza stunned as the show stopper for the collection. Anshu Jain’s collection was an eclectic blend of whites, red, blacks and beautiful prints. Mainly targeted at people attending destination weddings, the collection had beautiful Indo-Western gowns and Neo-sarees. 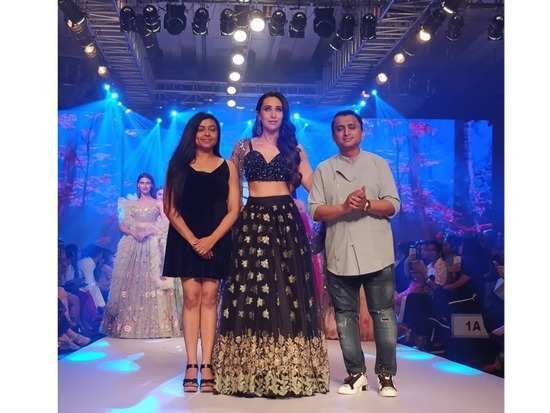 Karisma Kapoor looked stunning as she walked as the show stopper. Next up, was Hopscotch! And it was the cutest show ever. The kids wear brand gave us some serious thought to spruce up the wardrobes of the little ones. RAR Studio boasted a beautiful collection of breathable lehengas and anarkallis in black and white. Their show was closed by Miss Universe India 2nd Runner up, Naveli Deshmukh and actor Divya Khosla Kumar. Narendra Kumar’s collection with Traworld was vibrant and comfortable – perfect for someone who’s trying to look stylish during their travels. Archana Kochar’s collection of bridal wear had all the likes – sculptural gowns, neo sarees and gorgeous lehengas. Bollywood actor Diana Penty walked the ramp for the designer. 3Bollywood inspired ways to wear white to your Holi party this year! 4Priyanka Chopra Jonas’s sheer polka dot number and top-knot has the potential to be your uniform for summers! 6Alia, Deepika and Katrina paired the pink and red, who stole your attention?